Contemporary solid sterling silver bangle set in a classic design with a doublet opal with two diamonds. The 7mm diameter opal has green colours sparkling with a touch of pink; the bangle has a 15.5 cm circumference and will add pizzazz to any outfit. 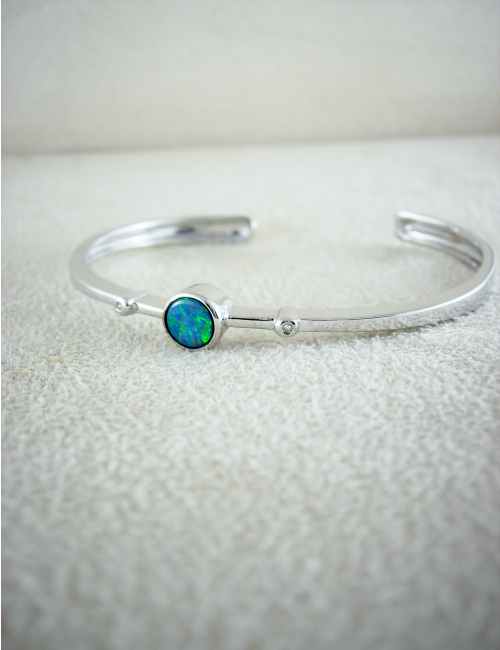 Contemporary solid sterling silver bangle set in a classic design with a doublet opal. The freeform shaped opal measures 18mm x 6mm and has blue opal colours sparkling with turquoise; the bangle has a 14.5 cm circumference and will add pizzazz to any outfit. A Boulder Opal bracelet with adjustable knotted waxed cotton, these versatile bracelets are popular with all ages. The opal measures 25mm x 13mm. 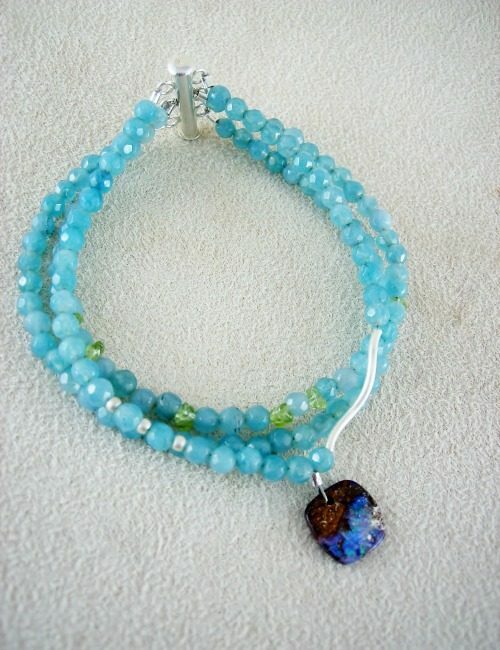 This attractive multi strand gemstone bracelet combines a bright sparkly turquoise green/blue boulder opal with facetted blue calcite, peridot, finished with sterling silver detail beads and clasp. The bracelet is 9cm in entire length, with the dainty 3mm diameter calcite beads and the boulder opal charm measuring 10mm x 10mm. This unique multi opal bracelet combines 5 boulder opals with facetted blue calcite and is finished with a strong magnetic clasp. The bracelet is 18.5 cm in entire length, with the dainty 3mm diameter calcite beads, the boulder opals are from 15mm in size graduating to 10 mm. This bracelet has three sparkling doublet opals set in a stylish design with anti tarnish sterling silver. The three opals are rich bright blue with a shimmer of green opal colours. The centre opal measures 9mm long, 5mm wide, complemented on either side with two matching teardrop shaped opals measuring 8mm long. The entire bracelet measures 16cm long, with an extension chain to take the length to 19 cm long if needed. 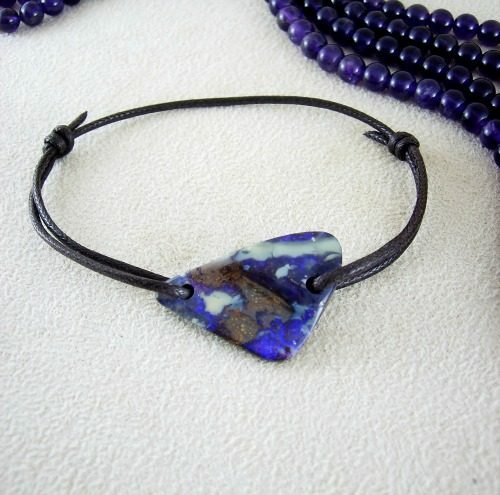 With shimmery violet opal colours, this boulder Opal bracelet has kick. It has a freeform oval shape and measures 30mm long x 13mm at the widest part. The bracelet comes with waxed cotton with slip knots to adjust the length so it will suit everybody. This style of bracelet is very popular with men, ladies, teenagers ……just about everyone! This boulder Opal bracelet has rivers of pastel opal colours running through the highly polished ironstone. It has a freeform shape and measures 35mm long x 17mm at the widest part. The bracelet comes with waxed cotton cord tied with slip knots to adjust the length so it will suit everybody. This style of bracelet is very popular with men, ladies, teenagers ……just about everyone! This boulder Opal bracelet has sky blue and caramel colours and measures 26mm long x 11mm wide. The bracelet comes with waxed cotton cord tied with slip knots to adjust the length so it will suit everybody. This style of bracelet is very popular with men, ladies, teenagers ……just about everyone! This boulder Opal bracelet has a bright purple and vanilla colours combined with the highly polished ironstone. It has a freeform shape with an organic undulating surface and measures 32mm long x 20mm at the widest part. The bracelet comes with waxed cotton with slip knots to adjust the length so it will suit everybody. This style of bracelet is very popular with men, ladies, teenagers ……just about everyone! This boulder Opal bracelet has mauve and sky blue colours with a touch of green that sparkle and glow, the opal measures 17mm x 10mm. The bracelet comes with waxed cotton cord tied with slip knots to adjust the length so it will suit everybody. This style of bracelet is very popular with just about everyone. This boulder Opal bracelet has bright electric blue green colours and measures 20mm long x 10mm wide. The bracelet comes with waxed cotton cord tied with slip knots to adjust the length so it will suit everybody. This style of bracelet is very popular with men, ladies, teenagers ……just about everyone! This Boulder Opal bracelet has a fabulous bright blue opal with the tan and chocolate brown ironstone. The opal measures 20mm long x 15mm wide and comes with waxed cotton cord tied with slip knots to adjust the length so it will suit everybody. This style of bracelet is very popular with men, ladies, teenagers ……just about everyone! This Boulder Opal bracelet has a combination of shimmery violet, honey and vanilla opal colours with an organic slightly undulating surface. The freeform shaped opal measures 27mm long x 19mm wide and comes with waxed cotton cord tied with slip knots to adjust the length so it will suit everybody. This style of bracelet is very popular with men, ladies, teenagers ……just about everyone!